Here is a cryptocurrency that may go onto dust bitcoin prices in 2018. Finder's March Cryptocurrency Predictions Survey has arrived, featuring bitcoin (BTC), Ethereum (ETH), and even Dogecoin (DOGE). In short, it shows how much potential altcoins have (or how big of a bubble they are). This month, nine fintech leaders provided their predictions on how the top 10 by market cap and top two trending cryptocurrencies will perform in 2018. When comparing the forecast market capitalizations for Bitcoin (BTC), Bitcoin Cash (BCH) and Ethereum (ETH) - the only three of the 12 coins with reported number of coins available - Bitcoin (BTC) has been in the lead for two months running. This month, Ethereum (ETH) is predicted to see the highest growth by the end of the year (+212%). That's a significant 18% more than Bitcoin's (BTC) 194% increase. Bitcoin Cash comes in third, sitting at +123%. All in all, it's looking pretty optimistic in the crypto world this month. Fred Schebesta, CEO and cofounder at finder.com says that, for Bitcoin (BTC), "the recent rollout of SegWit was good. But we need more adoption of improvements like Lightning Network." Neural's CEO, Jen Greyson, says that, "with more AI and blockchain projects coming into the space, we're going to see miners move away from Bitcoin, but that won't happen until the platforms are further developed over the course of the next year to 18 months. For now, Bitcoin will continue to be subject to massive volatility due to the futures trading. Honestly, valuation is anyone's guess at this point and is going to vary wildly from month to month." Despite this, Bitcoin (BTC) is set to remain king in terms of price. 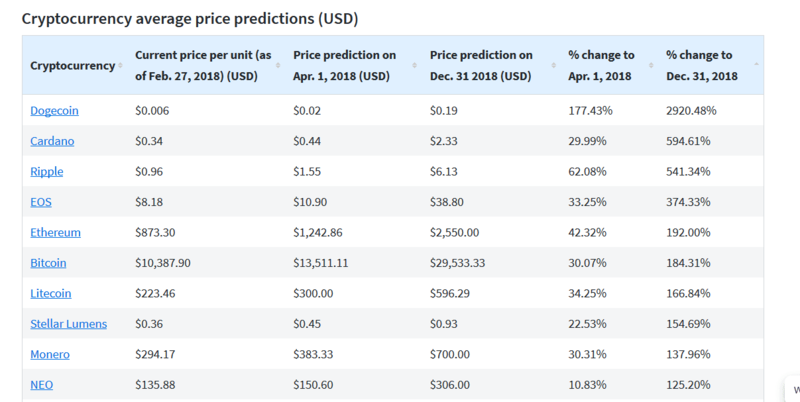 By December 31, 2018, on average, the panelists predict Ethereum (ETH) to be worth U.S. $2,550, whereas Bitcoin (BTC) is forecast to hit U.S. $29,533. Samson Williams, Partner at Axes and Eggs, acknowledges that the coin has a "huge community and [is] an excellent option for a real currency when #2018Recession kicks in." Alisa Gus, CEO at WishKnish says, "It is not exactly the most tech-savvy of coins, but as I mentioned last month, the loyalty can't be beat. It will be up overall, but it is not going to take the world by storm." Clayton Daniel, fintech founder at Sprout Superannuation says that "there are so many new coins and tokens coming on the market these days. As in the last report, I still like the decentralized exchange tokens. 0x is atop my list. I do think Ethereum Classic will also take off, because I believe that Coinbase will list it at some point." Check out more from ValueWalk here. Miss TheStreet's recent crypto webinar? Watch a clip below.